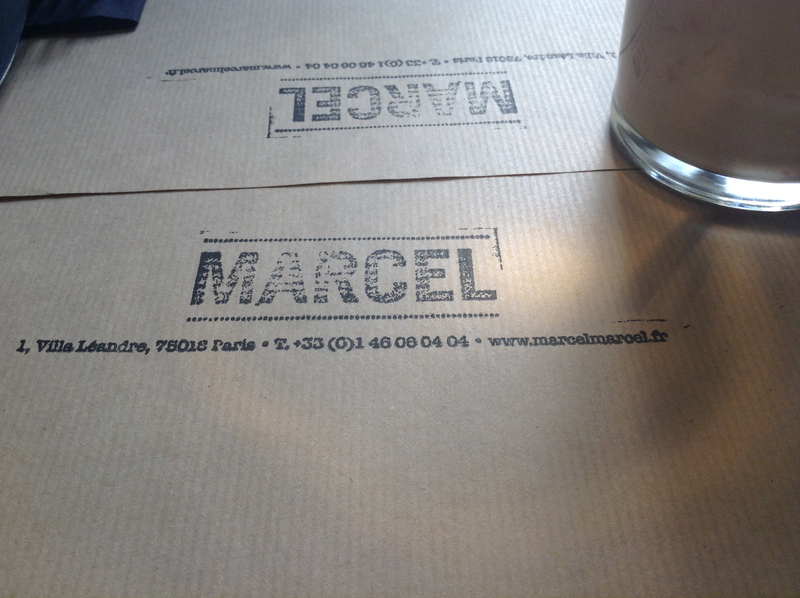 Had a nice lie in after a late night at Le Vieux Léon – got up and headed out to meet friends Dave, Lea, Ali and Carson for brunch at Marcel (in Montmartre). It’s become a bit of a tradition to have Sunday brunch while in Paris, and is a great excuse to have some good food and catch-up. Afterwards we wandered past Sacré Couer and headed down the hill for a refreshing tea / coffee in the sun. 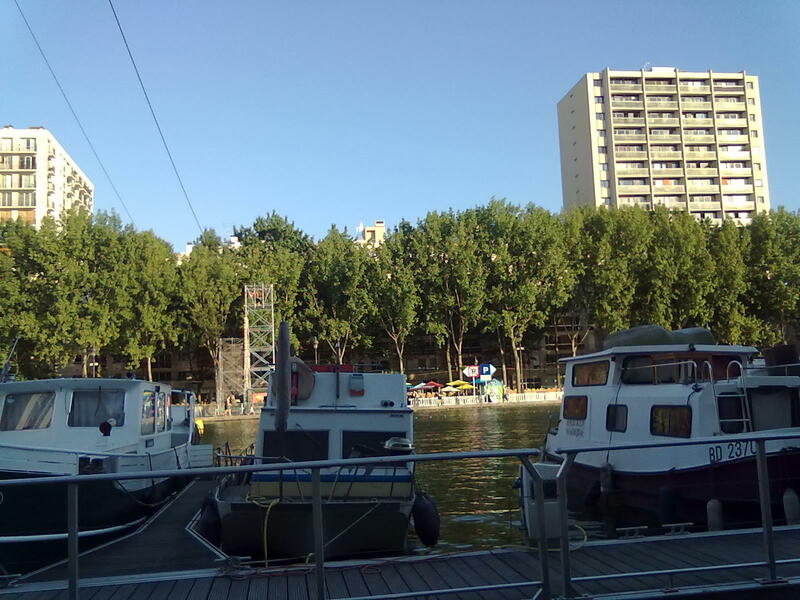 We then headed up from Gare du Nord to the Belushi’s in the 19th, which took us past the Paris Plages festival on the banks of the Canal. 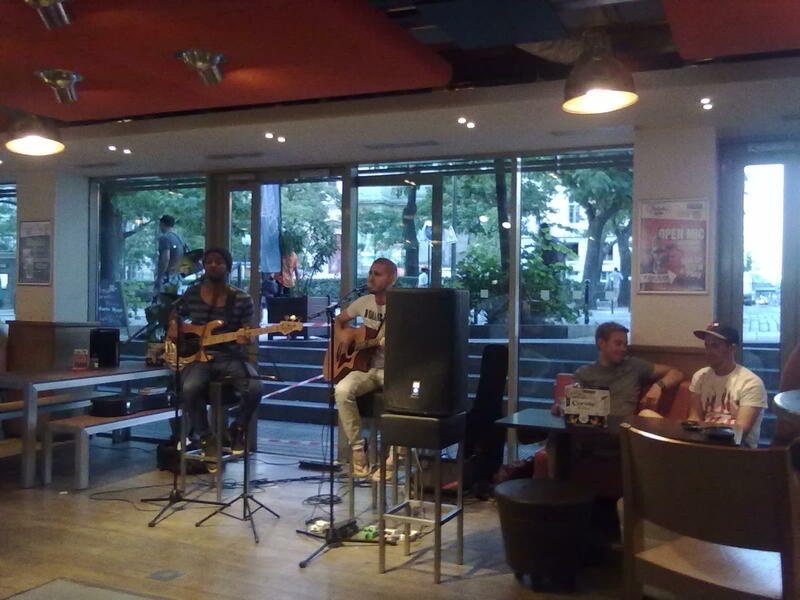 Sunday night is Open Mic at Belushi’s Canal, hosted by the very talented Dimitri (bass / vocals) and Micha (guitar / vocals). After they had a played a few songs and a mandolin player from Australia had played we jumped up with Lio providing beat box once again and played a few covers and originals. We hung out afterwards listening to more talent at the Open Mic and chatting with Tom, Rasheed and Lio. 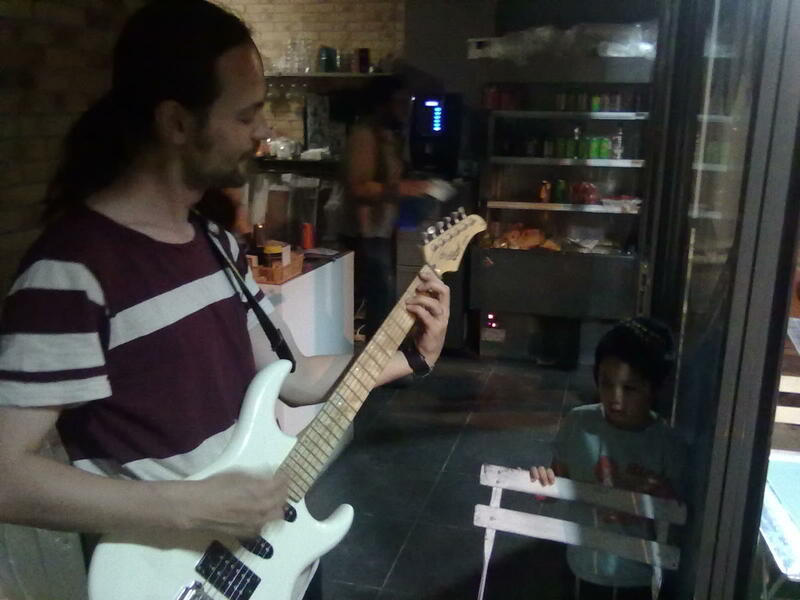 To finish off the night our good friend Jacob had asked us to perform a few songs at his restaurant a-Mi-Am-i. We used his electric guitar and played covers and original tracks to the diners and some friends of Jacob’s who had stopped by for a drink. It was a nice laid-back atmosphere and we ended up sitting out and chatting till the wee hours with Jacob and his wife. We also met a very cheeky little boy, who was very taken with Alexis and his guitar skills (F minor in particular seemed to go down well). 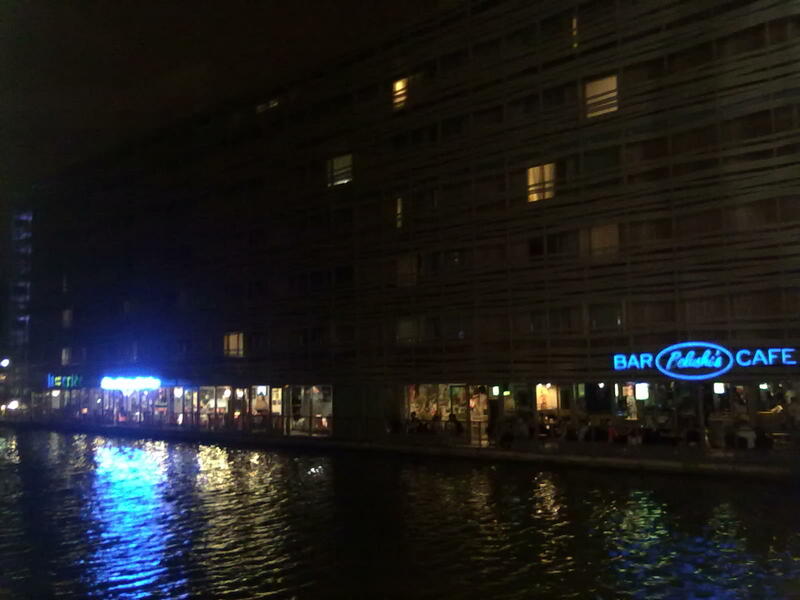 Headed back down to Belushi’s Gare du Nord to try and get some sleep before our “sleeper” train to Berlin the following night – once again a big thanks must go out to Ben for arranging our shows at both Belushi’s in Paris. Due to our re-arranged dates in Paris we get the day off today! So after a Belushi’s breakfast and chatting to some of the folk who are staying here we head out for lunch: curry @ JJR café just round the corner from the hostel on Rue du Faubourg Saint-Denis. In the afternoon we wandered along to the 1st to check out the venue we’re due to play on Saturday evening; Le Vieux Léon. The guy that booked us no longer works there, but the manager is happy for us to play either an acoustic or electronic set and has the tour postcards out in the bar. It seems like a really nice place & we’re definitely looking forward to playing to a different crowd in Paris. We initially targeted hostels in Europe as we felt the travelling community was a good bet for new fans, but the more we play in Paris the more we realise that these folk are mainly in the bar for good times (and beer pong), so might not remember anything about us in the morning. However we have been getting great feedback from the locals and even had a couple of extra gig offers in other venues this time round. “The division by gender reflects the creation of man and God’s universe. The Jewish tradition loves opposites and conflict: light and dark, day and night, man and woman, song and silence. We spent the evening at Belushi’s GDN – they had a live covers band playing who we wanted to check out before heading upstairs. The bar staff all really like this band so we were keen to see what songs they had in their set… was just the usual tunes (Wonderwall / Raspberry Beret etc) but played well – I guess that makes a big difference when you play such famous songs in your set. It was a very warm day in Paris, 33 degrees at 11am and due to get hotter as the day goes on. I think my peelie-wally Scottish skin is coping pretty well so far, but that is maybe due to the large amount of factor 50 that I’ve been applying. 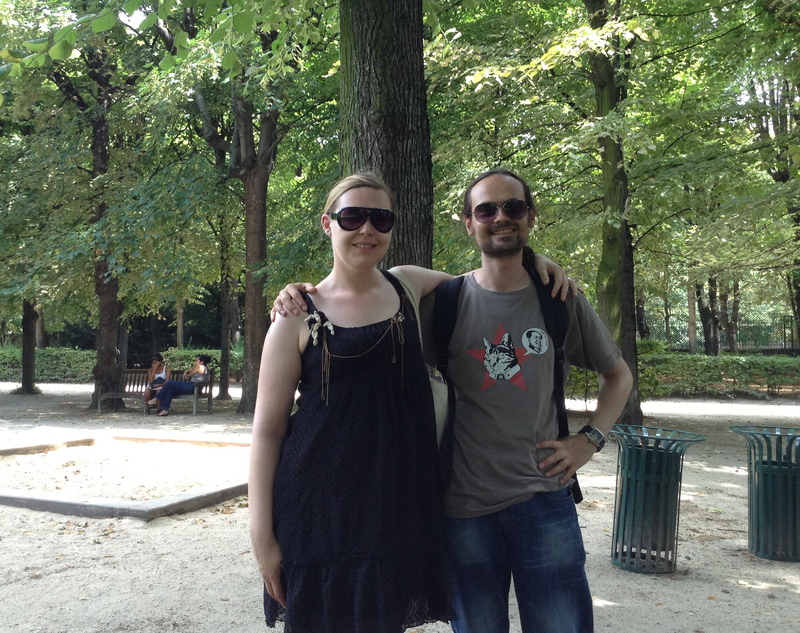 We spent the afternoon in the Rodin gardens and ate at the café there. The grounds of the museum are beautiful and so we spent ages wandering round seeing the marble and bronze works. We headed up to Belushi’s Canal for about 7.30pm to get set up for tonight’s show. Tom (the newly promoted bar manager) and Lio (the events manager) looked after us really well. Spending time up there is like hanging out at a friend’s house – very welcoming and laid back. The place has had a makeover since we last visited in March and the new drinks and food menus are very amusing. We ate at the bar and as always it was really good (much better than you expect from a Hostel / Bar). We played a mix of covers and originals and were lucky enough to be joined for a few tracks by Lio and his beat-boxing skills. If we lived in Paris we’d have to recruit him for the band! By the time we got back to GDN it was raining so we just went to our room and watched the first episode of ‘Jo’ (an American detective show set in Paris).